Enjoy the perfect blend of luxury, tranquillity and leisure at Lodha Codename Bullseye Mira Road! 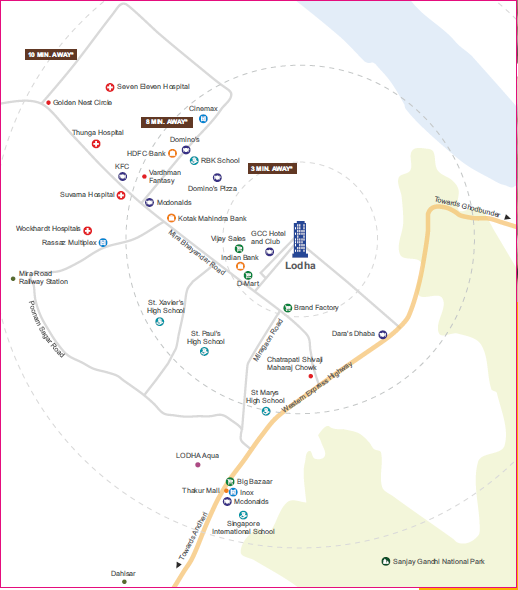 Lodha Group has launched a new project called Lodha Codename Bullseye Mira road, in Mumbai. Spread over acres of lush land, the project is surrounded by beautiful greens and mountains. If you are looking for a dream home in Mumbai city, then you should not look any further. The project has been designed aesthetically and offers all essential features and facilities necessary for a modern lifestyle. The new project offers exclusive 1 BHK and 2 BHK apartments in different configurations to meet the needs of different buyers. The apartments are designed in such a manner, that you will get the best space layout, with maximum sunlight and cross-ventilation. Each apartment has a huge lobby and waiting room for visitors, as well as terrace space with star gazing facility available at the top of the apartment. The residential project offers the latest internal and external amenities including a world-class clubhouse, water pool, big lawn with relaxation zone, underground parking car-parking space, well-equipped gymnasium, and much more. The complex is based on RCC frame structure which helps to protect the building from natural hazards. Each home is designed with the latest luxury and modern facilities, including split air-conditioners in bedrooms, marble flooring in living/dining, bedroom & passage, and premium vitrified tile flooring in the kitchen. The homes have the latest high quality lsenberg/Jaquar CP fittings & Kohler sanitary ware. The kitchen comes with a granite platform and stainless steel sink. The complex ensures complete security for your family with automated Swipe card access/ Biometric access to buildings as well as CCTV monitoring of entrance lobby. Lodha Codename Bulls Eye Mira road is one of the best upcoming locations in Mumbai, and is near a number of renowned schools and hospitals. The complex is near the Mira Road station and major transit routes and proposed corporate campuses. The strategic location allows great connectivity and easy accessibility from every part of Mira Road and Mumbai, making this one of the most sought after destinations in Mumbai. Located on Mira Road, Lodha Codename Bullseye is in close proximity to the GCC Club, upcoming Metro Station, Western Express Highway, Mira-Bhayandar Road, a number of shopping malls, renowned schools and much more. The area is well connected via a road and rail network to Mumbai and surrounding suburbs. Starting at Rs. 56 lakhs, Lodha Codename Bullseye price is extremely affordable. If you're moving to residential apartments at Mira Road, that will offers amazing connectivity, infrastructure and modern amenities then Lodha Bullseye is the best option. The area is expected to see immense appreciation in property prices and give excellent returns over a period of time. Renowned developer Lodha group is one of the most trusted real estate firms in India. With an experience spanning decades the firm is known for its world-class commercial and residential properties. The company has its own expert team of engineers and architect, which ensure that all the projects are built with latest and advanced technologies. The company’s vision is ‘Building a better life’ for each and every home buyer. Lodha Codename Bullseye Mira Road is one of the best offerings by the group, which will satisfy all your desires.